Eco print - Environmental print in Brisbane, the Gold Coast and Australia wide. Eco Digital is a business committed to producing ecologically sound printing. We can supply your business with both digital short run print and offset for larger run in the most eco friendly manner possible. We also sell eco products online. All of our offset work is produced on your choice of recycled paper using soy/veg based inks. Our digital printing is produced on the Xerox 5065 using your choice of recycled stock. Any stock choice that can be printed on the offset press can also be printed on the Xerox and we have a full finishing and binding service. We can supply printing from small quantities to very large and from business cards to A3 sheets. All with environmental considerations in mind. Please see our pricing page for current specials and fill in a quote request for a fast price on your print requirement. Deliveries can be made Australia wide. We invite you to read our environment page for tips and facts on green printing. 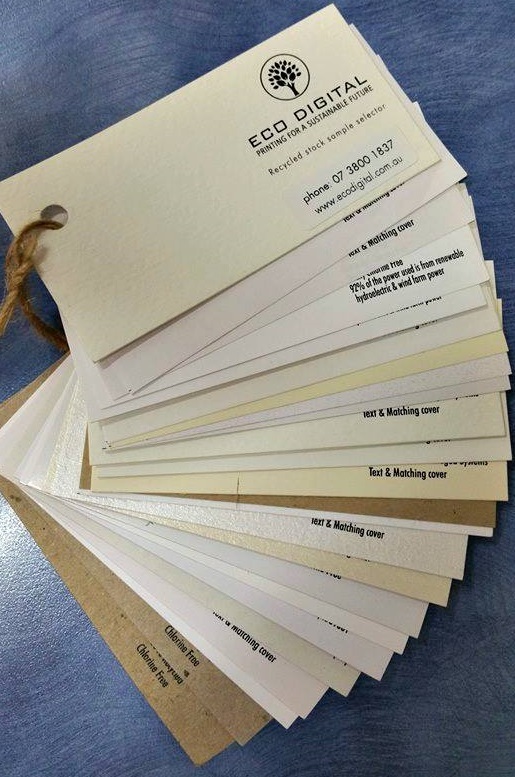 To make your selection very easy, we have available a sample swatch of a great range of recycled stock starting at a 100gsm Tudor RP up to the 350gsm Enviroboard. You can see and feel the paper stock to gain a clearer idea for your next project.